The history of Paris is a long, interesting and sadly a blood-stained one. The city may boast a timeless appeal, but don't let this condition fool you. The cobbled petit rues of Montmartre, the plateau-ridden cafés of Montparnasse, the unmistakable shape of the Eiffel Tower may all have some visitors believing that the city has been here since time immemorial, that’s hardly the case. Paris is an old, old city so it is hard to be completely accurate but the earliest archaeological signs of permanent settlements in the Paris area date from around 4200 BC. Ancient or what. When it comes to the history of Paris rock solid information about the early Celts is hard to come by but the most educated guesses say that Paris was settled around 300 BC by the Parisîi, a clan of Celtic Gauls. They set up camp on what is now the tiny islet of Île de la Cité. The Parisîi were successful fishermen and traders, and their settlement thrived until Julius Caesar’s Roman troops arrived in 52 BC. 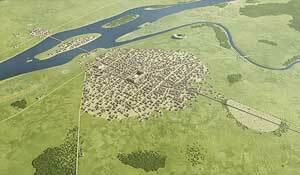 After centuries of battles between the Gauls and Romans, the latter wound up taking control of would-be-Paris circa 52 BC. This destruction of the city marks the beginning of what is perhaps the most enduring and treasured of all traditions in the history of Paris: military defeat. The Romans clearly liked the location of this little settlement on the water and so claimed it as their own, calling it Lutetia. It grew in size and importance, boasting a forum, palaces, baths and an amphitheater. Probably an improvement on the Gaul's settlement if we're honest. Christianity was introduced in the 2nd century AD and in a wise PR move, the town officially changed its name to Paris in the fourth century A.D. Things got better. According the legend, a man both human and beast, called Attila the Hun has interrupted in his habit of ravaging Gaul in the mid-400s by a peasant girl who appeared out of the dust on his approach to Paris. The girl was named Geneviève and her mighty prayer repelled Attila and he turned and ran. Geneviève became the city's patron saint in 509 and myth continues to intertwine with the history of Paris. The 3rd century AD brought an increased number of raids by both Franks and Alemanii from the east. This meant that Paris was pretty much piggy-in-the-middle. The Romans occupied Paris for a good couple of centuries and then their reign was thwarted by a second wave of Franks. After Clovis I's victory in 508 AD, the Franks made sure they made their mark on Paris. Succeeding king Childeric II commanded the construction of the Abbey of St-Germain des Prés, and a few steps below in the dynasty's ladder, King Dagobert came up with another abbey, this time in St-Denis. This abbey soon became the wealthiest, most powerful monastery in France and became the final resting place of its kings. Despite putting all this effort into building beautiful churches, the subsequent rulers of Paris were more interested in war than God. It began with Charles 'The Hammer' Martel (the clue is in the name) who ruled until 741 AD. When 'The Hammer's' grandson, the celebrated Charlemagne (768-814) moved his capital to Aix-la-Chapelle (today’s Aachen in Germany), Paris’ fate was sealed. The next period of the history of Paris is rather obscure. Weak and disunited, Paris was left exposed to attacks from the apparently tireless Vikings. Settlements on the banks of the Seine were again in ruins, and Parisians retreated back to Île de la Cité. The Counts of Paris began to consolidate power, made bolder by the in-fighting amongst the rulers. In 987, they elected Hugues Capet King and Paris became a capital once more. Paris was under Capetian rule for the next 800 years and the city blossomed. Philippe Auguste was by far the most successful of these medieval French kings and under his reign Paris became the richest city in the West. With the establishment of the University of Paris in 1215 and the Sorbonne in 1253, Paris was reorganized into two parts: the commercial Rive Droite (Right Bank) and the academic Rive Gauche (Left Bank), opening a much brighter episode in the history of Paris. The beautiful Sainte Chapelle was consecrated in 1248. A riverside fortress called the Louvre was also inagurated in circa 1200. A century later, Paris was the largest city in western Christiandom and the center of learning. Sadly, the future was not looking so rosy in the history of Paris. In 1337 the three centuries of hostilities between the Capetians and the Anglo-Normans (or Englishmen if you prefer) reached boiling point and the Hundred Years' War kicked off. To add insult to injury the Black Death arrived in Paris in 1348 and killed off an third of the population of the city (an estimated 80,000 souls) in only a year. King Edward III of England had decided to claim the throne of France for himself. The French took some serious battering over the course of the war (see, the unfortunate military record was continuing). The English took control of Paris in 1420 after they defeated the French at Agincourt. When the English crowned their own Henry VI king of France in 1431, legend has it that a 17-year-old peasant girl Joan of Arc was inspired by a choir of angels to persuade the French Pretender Charles VII made a bid for the throne. She led the Valois troops and defeated the English in Patay but failed to take Paris. Despite her heroism, she was captured by the English and burned at the stake in 1431 for heresy. The more than 16 years of occupation were ended in 1436 when Charles VII returned to Paris, but the English were not entirely driven from French territory for another 17 years. The occupation had devastated Paris. The most famous sights such as impressionist mecca Mont Martre and Montparnasse as well as the equally enchanting but underground Les Marais and Invalides.